The source WAN accelerator is configured on tenant’s side. The target WAN accelerator is configured on the SP side. The SP can configure several target WAN accelerators and assign them to different tenants. Each target WAN accelerator is strictly associated with tenant’s quota on the cloud repository and the hardware plan to which the tenant is subscribed (cloud host). This way, tenant’s data always go via the assigned target WAN accelerator and Veeam Backup & Replication can use the global cache on the target WAN accelerator more efficiently. 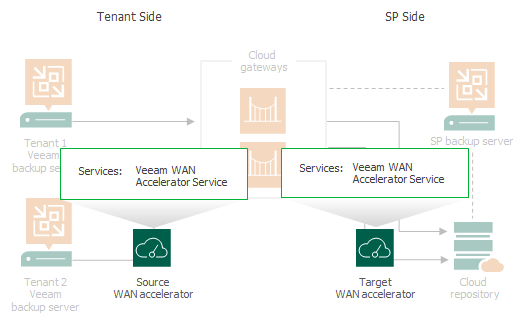 Tenants do not know about target WAN accelerators on the SP side: they can only see whether Veeam Cloud Connect resources can use WAN acceleration or not. When tenants create backup copy or replication jobs that transfer data via WAN accelerators, they define only the source WAN accelerator in the job properties. The target WAN accelerator is not selected. During the backup copy or replication job, the Veeam Cloud Connect Service on the SP Veeam backup server automatically assigns the necessary target WAN accelerator on the SP side for the job. Veeam Backup & Replication does not use tenant backups to populate global cache on the service provider side. For more information about global cache population, see Population of Global Cache.